Periodontitis is an immuno-inflammatory disease process resulting from the interaction of a bacterial attack and host inflammatory response. This leads to the inflammation of the supporting tissues of the teeth further leading to tissue destruction and tooth loss. Varieties of molecules are considered to mediate the inflammatory response at one time or another. Among these are free radicals (FRs) and reactive oxygen species (ROS) known to cause destruction such as superoxide anion radicals, hydrogen peroxide, hydroxyl radicals, and hypochlorous acid. All these molecules are capable of damaging either cell membranes or associated biomolecules. Periodontal pathogens can induce ROS overproduction and thus may cause collagen and periodontal cell breakdown. When ROS are scavenged by antioxidants, there is a reduction of collagen degradation. Hence, antioxidants are emerging as prophylactic and therapeutic agents. Antioxidants delivered by the diet,  systemically,  locally,  and through a dentifrice  have been shown to cause significant improvements in the measures of gingivitis, periodontitis, and oxidative injury. Coenzyme Q10 (CoQ10) was discovered in beef heart mitochondria at the University of Wisconsin. CoQ10 is also known as ubiquinone because of its ubiquitous presence in nature and its Quinone structure (similar to that of Vitamin K). It is also called as "coenzyme" because of its unique ability to participate in chemical reactions but remain at steady-state levels in the cell and plays a central role in energy metabolism. It has a positive inotropic effect. The effects and mechanisms of action of CoQ10 include stabilization of calcium-dependent channels, inhibition of intracellular phospholipases, prostaglandin metabolism, FR scavenging, and direct membrane stabilization. Co-Q10 is also known to play a crucial role in the generation of adenosine triphosphate (ATP) and cellular respiration. It exists in two molecular forms, ubiquinone, the oxidized form, and ubiquinol, the reduced form, which are the basis for its antioxidant properties. Co-Q10 functions as an intercellular antioxidant by acting as a primary scavenger of FRs and ROS. It serves as an endogenous antioxidant, and its increased concentration in the diseased gingiva effectively suppresses advanced periodontal inflammation. Thus, the aim of the study was to compare and evaluate the efficacy of Coenzyme Q10 and TTO gel as an adjunct to SRP in the treatment of chronic periodontitis. 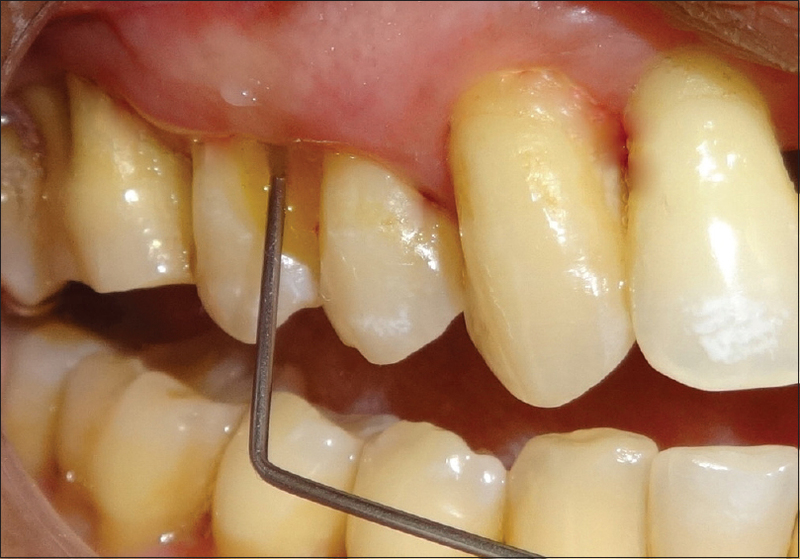 Subjects included in the study were patients with untreated moderate to severe chronic periodontitis, sites with probing pocket depth (PPD) of >5 mm and clinical attachment loss >4 mm. Perio Q® gel (PerioQ Inc., Manchester, USA) is a mixture of CoQ10 in a vegetable oil base in a ratio of 1:9. It is supplied as a pack of gel and was stored at a temperature between 4°C and 8°C for maintaining its shelf-life. The placebo gel preparation was same as that of tea-tree oil gel preparation except for the addition of tea-tree oil. Placebo gel was used to reduce any bias related to patient acceptance. A total number of 15 patients with 45 sites was included in the study. In each patient, three different sites were randomly divided by lottery method. Thus, a single patient was treated with all three treatment modalities to avoid any intersubject bias. Treatment sites in patients were randomly divided into three groups. Group III (Test Group 2): SRP plus TTO gel delivery. In total, 15 patients with 45 sites were enrolled in the study. Following clinical parameters were evaluated at baseline and 1 month follow-up. At the baseline, SRP was performed in all the groups. 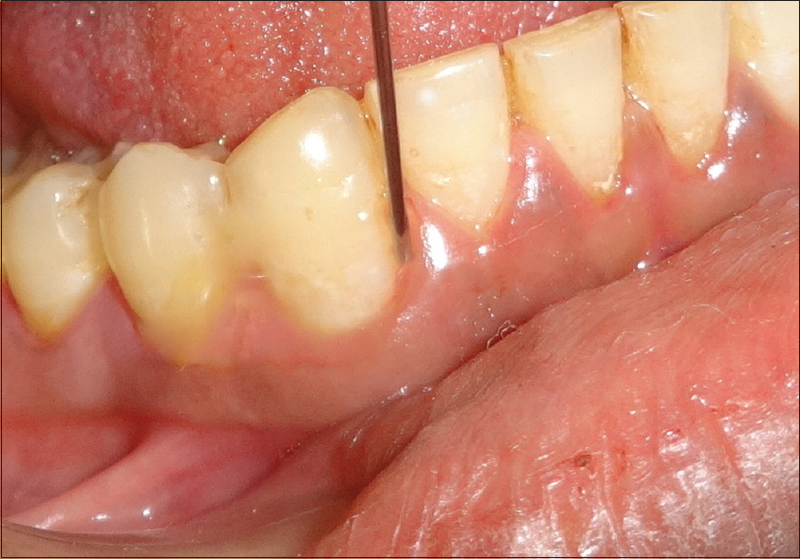 In Group I, placebo gel was placed into periodontal pocket. In Group II, the Local application of Coenzyme Q10 gel was performed using special needles designed to deliver gel in the pocket. In Group III, local delivery of TTO gel was performed after SRP [Figure 1] and [Figure 2]. After application of gel periodontal pack placement was done to avoid flowing away of the gel and for its sustained release into the periodontal pocket. Patients were recalled after 7 days for removal of pack and 1 month for follow-up. All the results were tabulated and statistically analyzed using Statistical Package for Social Science (SPSS Version 12, IBM Inc, Chicago, IL, USA). P < 0.05 was defined as statistically significant. Mean pocket depth at baseline and 1 month was found to be 5.10 ± 0.68-4.60 ± 0.47, 5.69 ± 0.83-2.74 ± 0.63, 5.60 ± 0.65-3.51 ± 0.50 in Group I, Group II, Group III, respectively. In Group I, mean pocket depth changes at baseline and 1 month were nonsignificant. In Group II and Group III, the difference in mean pocket depth at baseline and 1 month was statistically significant [Table 1]. Mean clinical attachment level changes at baseline and 1 month were found to be 5.22 ± 0.64-4.77 ± 0.42, 5.94 ± 0.80-3.61 ± 0.84, 6.05 ± 0.63-3.77 ± 0.54 in Group I, Group II, Group III, respectively. In Group I, mean clinical attachment level changes at baseline and 1 month were nonsignificant. In Group II and Group III, mean clinical attachment level changes from baseline to 1 month were significant [Table 2]. Mean PI scores at baseline and 1 month were 1.75 ± 0.45-1.08 ± 0.28, 1.66 ± 0.49-0.66 ± 0.38, and 1.83 ± 0.38-0.75 ± 0.33 in Group I, Group II, and Group III, respectively. The changes in mean PI scores from baseline to 1 month follow-up were significant in all three groups [Table 3]. Mean gingival bleeding index scores changes from baseline to 1 month were 1.83 ± 0.57-0.91 ± 0.28, 1.91 ± 0.51-0.83 ± 0.38, 1.83 ± 0.38-0.95 ± 0.14 in Group I, Group II, Group III, respectively. Changes from baseline to 1 month follow-up were significant in all three groups (Group I, Group II, Group III) [Table 4]. Antioxidant therapy is believed to be effective in periodontitis. However, studies exploring the role of antioxidants have shown mixed results. ,, In this study, two antioxidant gels that are Coenzyme Q10 gel and TTO gel were used for the treatment of periodontitis. Coenzyme Q10 gel was available commercially (Perio Q® ) and TTO gel was prepared using the protocols described previously. However, there are limited data regarding the comparison of Coenzyme Q10 and TTO gel as an antioxidant in the treatment of chronic periodontitis. The results of the present study show that there was no significant difference between the two test groups. However, patients in Group III reported with slight change in taste after the application of TTO gel. No such change in taste was reported after the use of Coenzyme Q10 gel. Thus, results of the present study brighten the futuristic aspect of using antioxidant gels as a local drug delivery system in subgingival sites. The limitation of the present clinical trial was the small sample size and the short duration for determining the efficacy of the experimental drug. Thus, further studies are recommended with larger sample size for the evaluation of the efficacy of this antioxidants in the form of gel in the treatment of chronic periodontitis. The concomitant biochemical and microbial analysis could also help in better interpretation of findings. Within the limitations of the present study, coenzyme Q10, and TTO gel as an adjunct to SRP proved to be effective in the treatment of periodontitis. Furthermore, it emphasizes the potential therapeutic value of two agents as an antioxidant which can reduce inflammation and promote healing of periodontal tissues. Prakash S, Sunitha J, Hans M. Role of coenzyme Q(10) as an antioxidant and bioenergizer in periodontal diseases. Indian J Pharmacol 2010;42:334-7. Wood N, Johnson RB. The relationship between tomato intake and congestive heart failure risk in periodontitis subjects. J Clin Periodontol 2004;31:574-80. Chandra RV, Prabhuji ML, Roopa DA, Ravirajan S, Kishore HC. Efficacy of lycopene in the treatment of gingivitis: A randomised, placebo-controlled clinical trial. Oral Health Prev Dent 2007;5:327-36. Chandra RV, Sandhya YP, Nagarajan S, Reddy BH, Naveen A, Murthy KR. Efficacy of lycopene as a locally delivered gel in the treatment of chronic periodontitis: Smokers vs nonsmokers. Quintessence Int 2012;43:401-11. Maruyama T, Tomofuji T, Endo Y, Irie K, Azuma T, Ekuni D, et al. Supplementation of green tea catechins in dentifrices suppresses gingival oxidative stress and periodontal inflammation. Arch Oral Biol 2011;56:48-53. Hans M, Prakash S, Gupta S. Clinical evaluation of topical application of perio-Q gel (Coenzyme Q(10)) in chronic periodontitis patients. J Indian Soc Periodontol 2012;16:193-9. Soni S, Agrawal PK, Sharma N, Chander S. Coenzyme Q10 and periodontal health: A review. Int J Oral Maxillofac Pathol 2012;3:21-6. Littarru GP, Tiano L. Bioenergetic and antioxidant properties of coenzyme Q10: Recent developments. Mol Biotechnol 2007;37:31-7. Pepping J. Coenzyme Q10. Am J Health Syst Pharm 1999;56:519-21. Al-Hasso S. Coenzyme Q10: A review. Hosp Pharm 2000;35:51-5. Soukoulis S, Hirsch R. The effects of a tea tree oil-containing gel on plaque and chronic gingivitis. Aust Dent J 2004;49:78-83. Schätzle M, Löe H, Lang NP, Heitz-Mayfield LJ, Bürgin W, Anerud A, et al. Clinical course of chronic periodontitis. III. Patterns, variations and risks of attachment loss. J Clin Periodontol 2003;30:909-18. Killen JD, Fortmann SP, Telch MJ, Newman B. Are heavy smokers different from light smokers? A comparison after 48 hours without cigarettes. JAMA 1988;260:1581-5. Enshaieh S, Jooya A, Siadat AH, Iraji F. The efficacy of 5% topical tea tree oil gel in mild to moderate acne vulgaris: A randomized, double-blind placebo-controlled study. Indian J Dermatol Venereol Leprol 2007;73:22-5. Ramfjord SP. The periodontal disease index (PDI). J Periodontol 1967;38:602-10. Battino M, Bullon P, Wilson M, Newman H. Oxidative injury and inflammatory periodontal diseases: The challenge of anti-oxidants to free radicals and reactive oxygen species. Crit Rev Oral Biol Med 1999;10:458-76. Tüter G, Kurtis B, Serdar M. Interleukin-1beta and thiobarbituric acid reactive substance (TBARS) levels after phase I periodontal therapy in patients with chronic periodontitis. J Periodontol 2001;72:883-8. Battino M, Ferreiro MS, Fattorini D, Bullon P. In vitro antioxidant activities of mouthrinses and their components. J Clin Periodontol 2002;29:462-7. Neiva RF, Steigenga J, Al-Shammari KF, Wang HL. Effects of specific nutrients on periodontal disease onset, progression and treatment. J Clin Periodontol 2003;30:579-89. Bentinger M, Tekle M, Dallner G. Coenzyme Q - Biosynthesis and functions. Biochem Biophys Res Commun 2010;396:74-9. Saxer UP, Stäuble A, Szabo SH, Menghini G. Effect of mouthwashing with tea tree oil on plaque and inflammation. Schweiz Monatsschr Zahnmed 2003;113:985-96. Takarada K, Kimizuka R, Takahashi N, Honma K, Okuda K, Kato T. A comparison of the antibacterial efficacies of essential oils against oral pathogens. Oral Microbiol Immunol 2004;19:61-4. Arweiler NB, Donos N, Netuschil L, Reich E, Sculean A. Clinical and antibacterial effect of tea tree oil - A pilot study. Clin Oral Investig 2000;4:70-3. Chatterjee A, Kandwal A, Singh N, Singh A. Evaluation of Co-Q10 anti-gingivitis effect on plaque induced gingivitis: A randomized controlled clinical trial. J Indian Soc Periodontol 2012;16:539-42.